Looks like NordVPN’s team is working hard these days as they keep adding new and new stuff. The latest addition is a new feature on iOS and macOS apps. You can now select a specific city from the server list. Before you could only choose a country and you didn’t know which city you are actually connected to. Approximately one month after releasing the redesigned version of iOS and macOS app, NordVPN comes with another important update. In the latest version, you can finally select a specific city to which you want to connect. Before you could only select a country, but you had no idea to which city you are connected. It was also one of the few negative points for NordVPN we have picked in our independent review. To select a specific city simply click on the three dots next to the country name and the full server list will open. Then just select one of the cities. Unfortunately, the city selection is not available in all countries. It looks like it’s available only for countries which have 2 or more cities. Still, the app could at least mention what is the only city in the country. 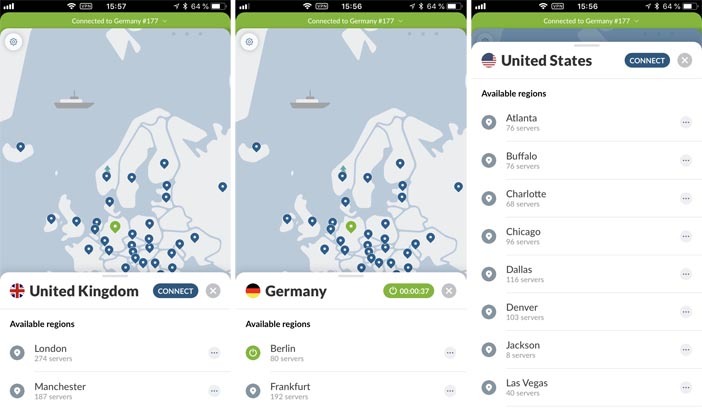 NordVPN team also confirmed the city selection will be available on Windows and Android apps. They didn’t provide an ETA. Hello! The option to choose a server by the city will be implemented in Android and Windows applications as well! However, we cannot provide ETA yet, since that information might be misleading. NordVPN is our #1 most recommended VPN solution. Scoring 96% in our independent review. It offers advanced features, a wide variety of servers and reliable no-log policy. With our special discount coupon, you can have it for only $2.75 per month. Next Article Cyber Month Offer: Get HideMyAss and Save $324 – THIS MONTH ONLY!